Being media has its upsides and downsides. Without the press kit to inform me that FIBBER, by Theatre Gargantua, was a play intent on “exploring the slippery relationship between truth we instinctively seek and the untruth our happiness depends on” I would have never known it was about anything. Or that it was even a play. On the downside, I had to sit through an hour of FIBBER. It starts with a man shouting at the audience that this play has multiple personality disorder. Another actor, for no apparent reason, strangles him. After about forty minutes of pretentious monologues, bizarre shorts and shallow insights, I could understand his motivation. This play would be much improved by strangulation. The cast certainly did not lack for a noose. The set is bare except for 2000 feet of rope tied into 1020 knots. 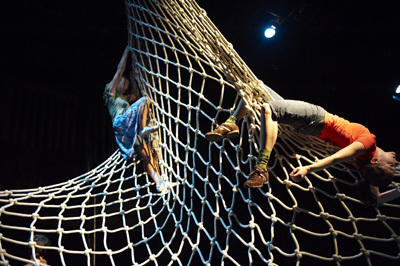 The actors make good use of these; climbing them, fashioning them into some fascinating shapes – including a spider’s web – and using the ropes as props. It reminded me of my bedroom on a Saturday night. What they did with such a simple set was amazing. As trapeze, the show was a success. Using their bodies with grace and intensity, the actors were quite marvelous to behold. Except when they were dancing. These sequences were bad cartwheels mixed with a great deal of running, flailing and flopping. But, during their monologues, they squeezed more tension and interest out of their hands that the writer could squeeze from his words. But FIBBER only succeeds on the physical level. There are no characters, no ideas that would surprise a stoned fifteen year old and no point. It’s just a disorganized series of skits, monologues and dance numbers, barely held together by a shaky premise. It seems to be a play about a play that’s about your mind. Or something like that. It’s hard to tell. Although I tried to explain to her that it was a reflection on truth, I lost heart halfway through the first sentence and fell into disconsolate silence. I was simply parroting the press release. When faced with something like FIBBER that is a temptation. But, without that prepackaged verbiage and taken on its own merits, the play might be about how a play investigates the truth. In this case, very badly. For even if you can get past the disorganized execution and if you were to be extremely generous, the best you could say is that FIBBER is philosophically disingenuous to the point of being empty. FIBBER is a straw man set up against itself. While it uses dramatics, dance and monologue to examine each form, it utterly neglects character, plot and any other tool that makes that search for truth not only engaging but possible. One might as well question books by criticizing random letters on a page. It mistakes form for substance. What substance the play did possess felt sophomoric, if not utterly moronic. In one of the poorly constructed vignettes, a man attempts to bed a woman who talks too much and thinks even more. The seduction turns into a meditation upon nature. He finally tells her she’s beautiful and gets what he’s after. What have we learned from this? Nothing that I hadn’t learned by seventeen. But every cloud has a silver lining. The cookies at the concession booth were delicious. Best dollar my date ever spent. Oct 2, 3, 4 / Oct 7, 9, 10 / Oct 16, 17, 18 — All performances at 8 pm but there is a 2 pm matinee on Oct. 18 for $20.